On 10-11 August 2016 representatives of the joint EU/UNDP Project “Community Based Approach to Local Development” – Community Development Specialist Oleksandr Ryabyi, the CBA Project Engineer Larysa Batchenko, Community Development Officer in Donetsk region Nelia Dashkovets – visited partner cities of Donetsk region. The visit was aimed to monitor development of the Associations of Co-owners of Multi-apartment Buildings (ACMBs) in the partner-cities. Positively impressed those ACMBs which were developed in terms of the CBA and work with accordance to the Project’s methodology. In the basement of multi apartment buildings, they created equipped spaces for children, where they can play in winter; there is also a free gym for kids where they can do physical exercises. This was done by the members of the ACMB after participation in the CBA Project and people did this for their own costs without external support. 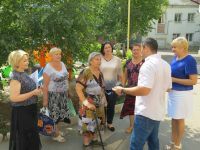 In terms of the visit the CBA Project representatives did analysis of project documentation on “smart cities” component in Dobropillia, Myrnohrad and Bahmut cities and suggested amendments to the microproject proposals and project documentation. Currently the status of readiness of the “smart cities” microprojects is approximately 80%. To enhance their capacities proactive ACMBs fo Bahmut, Dobropillia and Myrnohrad cities received from the CBA Project office equipment during Local Development Forums. Communication with people who overcome all the obstacles and went an extra mile to become a successful and sustainable community proves the effectiveness of participatory approach and local sustainable development methodology.